Airports - The first thought could be anything from waiting in an airport or visualizing airports from above in a time-lapse. 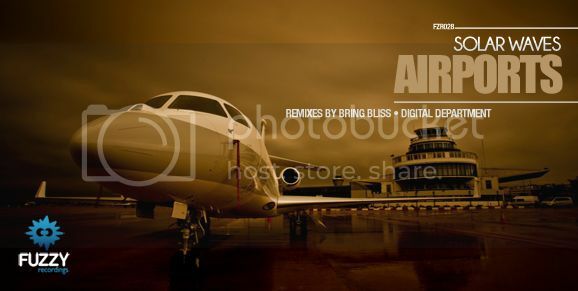 Any mind picture fits perfectly well as the styles vary all the way from the deep and progressive original track to the more rhythmic Digital Department remix and to Bring Bliss's - just as his name would reveal, blissful remix. The original track has got that deep and dark buildup which later on marches into a breakdown that features faint talking with drone sounds. Like a trail on an airplane, the rhythmic and swinged shakers follows through the whole track along with some classic hit piano chords in the breakdown. Later on the deep bass line and powerful kick makes an entrance once again and later proceeds into a classic rhythmical outro. Digital Department's remix of Airports starts off pretty easy but adds on as the intro progresses. During the later parts of the intro - the synths starts building up. A whole collection of synths all gathered up to turn this rhythmic track into something melodic and to capture its listener into the harmonies. The kick pattern changes between a 4 by 4 into a more alternative pattern during some parts of the remix. Playful use of vocals, groovy bass line and blissful arps. Bring Bliss lives up to his name with this remix. Several styles all mixed together to create this joyful and euphoric remix with a steady deep and groovy structure. It's still hard not to visualize the airport terminals as the faint talking makes a part of the breakdown. Overall, the EP contains several styles and lives up to its name to the point where you imagine the terminals of airports and all the remixes seem to give a perspective from several different standpoints in different airports. Last edited by Fuzzy Recordings; Jan 27th, 2014 at 14:26.